Here, you'll find our mares. The mares play an extremely important role. After all, it's them who have to carry the foals for all those months! Enjoy looking at these lovely ladies! 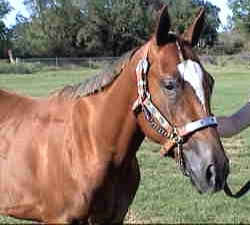 Emerald is our chestnut Arabian filly. She has been shown twice, and may be shown some more in the future. She has been started under saddle, but not ridden. She is unregistered, but has Arabian written all over her. 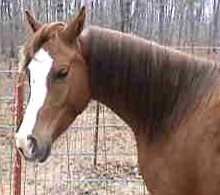 We have thought about breeding her for a Pinto colored Arab, but it still depends. She is offered for sale to a good home only. 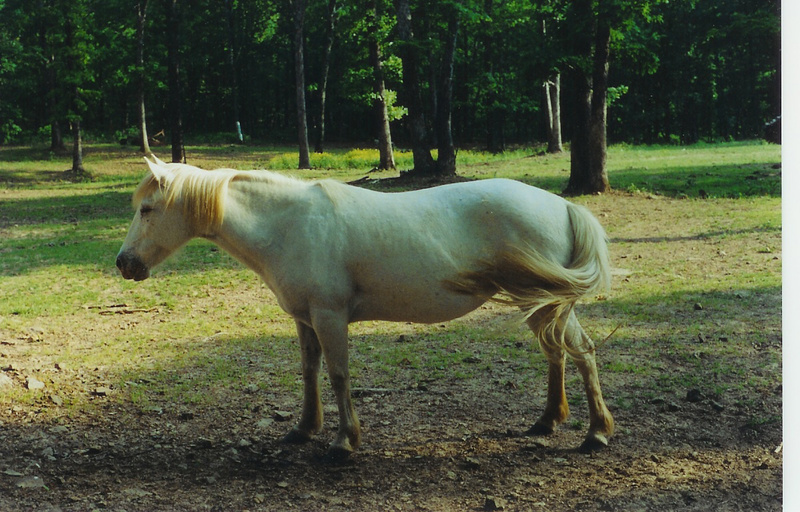 Lilly is our POA mare that we've had since 1996. She is a sturdy little pony, standing about 13 hands high. We know that she is the dam of Rocket, who we donated to riding program. She is a good mama, and we are thinking of getting her bred again in the future. Unfortunately she is now blind from Moon Blindness, but we think she can possibly see shadows; as she can get around as well as the others.